Come morning, Mateo and Leona met with a woman named The Officiant. She operated at a level of law that goes beyond humanity, and real time. As it turned out, she was the officiant at Horace and Serkan’s wedding. They had no idea at the time, assuming she was just a regular human. But the Officiant is always there for this purpose. She would later be revealed to have married Aura and Samsonite, as well as Horace and Leona in the other reality, though in male form for the latter. “We understand that,” Mateo said. Mateo tried to answer, but she shushed him. Mateo and Leona took their respective sticky notes. She leaned back in her chair, gently pressing the tips of her fingers together, exuding a quality of easy peace. Another aspect of the parity wedding is the equality of behavior. The man does not wait for the woman to come to him down the aisle, as if their life together cannot begin until she does. The concordants, as they are referred to in a parity wedding, walk down the aisle together, followed by their two chief attendants, and any honor attendants. This had to wait a little bit when little Dar’cy, who was growing up so fast, accidentally threw the rings onto the ground along with the flower pedals. Her mother and a woman from another universe named Zoey, who had arrived late, and accidentally on the Colosseum battlegrounds, helped her find them so the ceremony could continue. The concordants had to walk the whole way between the banquet tables in the Colosseum replica. The place looked beautiful, with the nicest table cloths, and padded chairs. Tasteful and elegant paper lanterns were hanging down in midair. Evidently a good version of Kayetan Glaston was merging them individually from different times and places all over the world. He would have to thank him for that later. 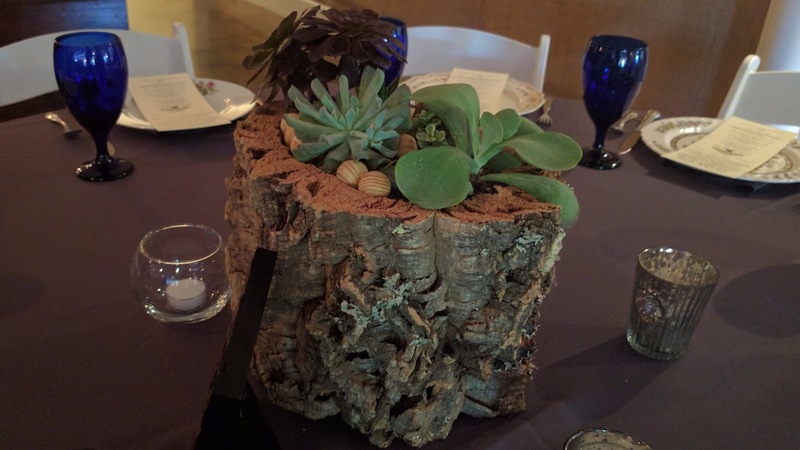 Each and every centerpiece was unique, and handcrafted by their friends on Tribulation Island, primarily Darko and Marcy. They had apparently worked on them all throughout the interim year. It was too much, they shouldn’t have done all this for them. The audience of over 48,000 was overwhelming, and they all looked happy to be there. Why was this so important to everyone? Was it just a novelty? Afterall, there probably weren’t a whole lot of weddings in the real Colosseum, and this was giving a bunch of time travelers the chance to come together, and maybe forget about their problems. If this could do that for them, then Mateo was glad to help them, if only for a little bit. Waiting for them on the stage was the Officiant. Behind them came Leona’s chief attendant, Horace, and Mateo’s, Serif. Her honor attendants were Lincoln and Marcy. Mateo’s were his once-father and once-brother, Mario and Darko. Paige was zipping around, taking photos of them. Someone he didn’t recognize was controlling the video drones overhead. “I dig the outfits,” Darko whispered to him. “You’re owning it.” They were both dressed in salmon-colored wedding clothes. She was wearing a sleeved dress with a skirt that dropped just below her knees, and he was wearing a tuxedo, but no tie. They figured the powers that be would either get a kick out of it, or be made uncomfortable by it. Ellie, who Mateo remembered from the Uluru tribulation, climbed the stairs from the back of the stage and smiled at them. “It’s pretty easy,” she told them. “When you want to project your voice, think about projecting your voice. When you want to speak just to the people in realtime earshot, think that instead. I am going to have to...invade your personal bubbles, though. It won’t hurt.” She reached up and placed the palm of her soft and cold hand over Mateo’s mouth. She smelled of cedar and milk. After a few seconds, she slid her hand away, and did the same to Leona. “Now, we begin!” the Officiant said. Her voice boomed in the sky so that all could hear. “We meet at this time, at this place, to witness the marriage of two souls. This ceremony might seem strange to some of you. You may be from a time when weddings were done behind a barn, with little fanfare. You may be from a land where marriage simply is not common. Whenever, wherever, you live, you are here now. You are with Mateo and Leona on their special day. They met each other one-hundred and twenty-eight years ago. “They’ve known each other for an indeterminate amount of time, due to special relativity, pocket dimensionality, and alternate timelines. They have seen the future, they have seen the past, and they are always in the present. Not all of their family is here with them today, but they will soon return to us. When they do, they’re going to come home to a stronger couple. I believe they would like to say a few words.” She nodded to Mateo so he could begin. He cleared his throat, desperately hoping Ellie’s brief lesson on spacetime projecting was enough for him to understand. She was off to the side, still smiling, but now nodding to indicate that he was doing well. Finally, after an awkward silence, Mateo felt like it was time to just get going. “Leona Gelen Delaney-Reaver. When we first met, you threw up on me. You were just a kid, and I was waaay to old for you. But I was just starting this difficult part of my life. I was skipping time, and leaving everyone I loved behind. Or rather, they were living their lives, and I was the one who was left out. In less than two weeks from my perspective, you and I were the same age. And at that moment, you joined me. I did not want this for you, but clearly it was meant to be, because I could not have gotten through this without you. When we’re not together, you’re in my head...and my heart. You get me through my worst times. I want to thank you for all you’ve done, and I hope that someday, I’ll be able to repay you.” He wrote his vows down earlier in the day, but ended up changing a lot in the heat of the moment. He really shouldn’t have, though, because that felt awful. What was that about him not wanting this for her? God, that was bad. Maybe he screwed up further, and no one had even heard it, but Ellie was nodding still, so apparently he really had just humiliated himself in front of tens of thousands of people. And who knows who will end up seeing the drone footage...or already has. Leona was silent, but the Officiant gave it some time before moving on, just to be sure. “Then through the power of time, I declare you bound in marriage.” Finally.